Registration for Primary, Beginner & Novice dancers will begin at 8:00 A.M. and end at 8:45 A.M. The competition will start at 9:00 A.M. with the Beginner and Novice Lilt, followed by Primary Pas de Basques. Registration for all Choreography competitions will being at 11:00 A.M. and end at 11:20 A.M. with the choreography competition starting at the conclusion of the morning awards (approximately 11:30 A.M.). Choreography max of 3 min. Please email music to QOSDA@hotmail.com by November 9th or bring cued music on iPod or CD. Intermediate & Premier registration will begin at 12:30 P.M. and end at 12:50 A.M. with the afternoon competition starting at the conclusion of the choreography awards (approximately 1:00 P.M.) with the Intermediate Fling. Dances will be competed in order listed below. Doors to competition venue will open at 8:00 A.M.
Competition will be conducted in accordance with the rules of S.O.B.H.D. Age groups will be determined by entries received. The decision of the judge is final. 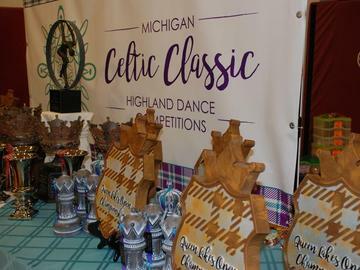 Entry fees to be mailed to Celtic Classic, 39491 Parklawn, Sterling Heights, MI 48313. Registrations will be confirmed via eMail within 10-days of receipt. All checks to be made payable to “QSDA” in US Funds (Canadian checks not accepted – must be money order in US funds). Dance numbers will be provided at registration. Entrance fee to competition $5 per person (12 and over). Children under 12 enter free. No concessions will be provided. Contact QOSDA@hotmail.com with questions regarding the competition and flutediva3@netzero.com with questions regarding your entry or visit www.QOSDA.com. 51620 Shelby Parkway, Shelby Township, MI. (586) 731-4267. 90 rooms in this 100% smoke free hotel, 15 minutes from competition, multiple restaurants nearby, complimentary breakfast, indoor pool, fitness center, complimentary beverage area, and free high speed internet all for only $99/night. Be sure to ask for “Celtic Classic” to get the guaranteed discounted room rate! Block will be closed on October 21st so book early!